Just in time for October is Breast Cancer Awareness Month, The American Cancer Society has released new guidelines for breast cancer screening. The big change? Mammograms should begin five years later than previously recommended. Now, the yearly exams should begin at 45 and then go to every other year starting at age 55. Part of the reasoning is to avoid false positives which have lead more ultimately unnecessary additional testing. The guidelines were published October 20, 2015 in the Journal of the American Medical Association. According to the American Cancer Society’s Chief Cancer Control Officer, Dr. Richard C. Wender, MD, new research has helped doctors understand the best ways to use mammograms for screening. • Women with an average risk of breast cancer – most women – should begin yearly mammograms at age 45. 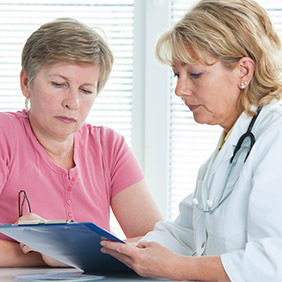 • Women should be able to start the screening as early as age 40, if they want to. It’s a good idea to start talking to your health care provider at age 40 about when you should begin screening. • At age 55, women should have mammograms every other year – though women who want to keep having yearly mammograms should be able to do so. • Regular mammograms should continue for as long as a woman is in good health. • Breast exams, either from a medical provider or self-exams, are no longer recommended. The guidelines are for women at average risk for breast cancer. Women at high risk – because of family history, a breast condition, or another reason – need to begin screening earlier and/or more often. Talk to your medical provider to be sure. The goal of screening mammograms is to find breast cancer early, when treatment is more likely to be successful. But mammograms aren’t perfect, and they do have risks. Sometimes mammograms find something suspicious that turns out to be harmless, but must be checked out through more tests that also carry risks including pain, anxiety, and other side effects. Experts weigh these benefits and risks when making recommendations about who should be screened. But once a woman turns 55, said Elizabeth T.H. Fontham, MPH, DrPH, member of the Guideline Development Group, screening every other year preserves most of the benefit of screening every year–with fewer risks. Breast exams are no longer a part of the screening recommendations because research does not show they provide a clear benefit. Still, the American Cancer Society says all women should be familiar with how their breasts normally look and feel and report any changes to their health care provider right away. The best way to know when to begin screening for mammograms and how often to get screenings is to talk to your medical provider. • Begin talking to your medical provider about breast cancer screening by age 40. • Share your family history and personal medical history to determine whether you are at average risk or higher risk for breast cancer. • Understand the benefits, risks, and limitations of breast cancer screening. Mammograms will find most, but not all breast cancers. Learn more about breast cancer screening by calling the American Cancer Society anytime day or night at 1-800-227-2345 or by visiting The American Cancer Society.